Wow, oh, wow! If you are looking for children’s book that is entertaining for both kids and adults, I have the one for you. 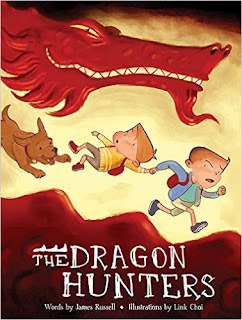 The Dragon Hunters by James Russell is so much fun! This children’s book tells the adventurous story of two young brothers who go on an epic quest to rescue their pet dog from a dragon. The illustrations are eye-catching, and the rhymes keep the pace fast and silly. A book that captures my child’s attention with rhymes such as “derriere” and “fresh air” is sure to be a hit in our home. My two children loved the story, and I thoroughly enjoyed reading it aloud with them. In addition to their rescuing efforts told with great rhythm and rhymes, excellent illustrations, the book is also set up to work with a downloadable app. The app makes the story come alive! Even more fun – this is just Book 1 in what is sure to be an exciting trilogy. I highly recommend this upcoming children’s book for all families. This is a book you will want to read over and over again. * You may preorder this book from amazon here. This is an affiliate link. Thank you for supporting my blog!